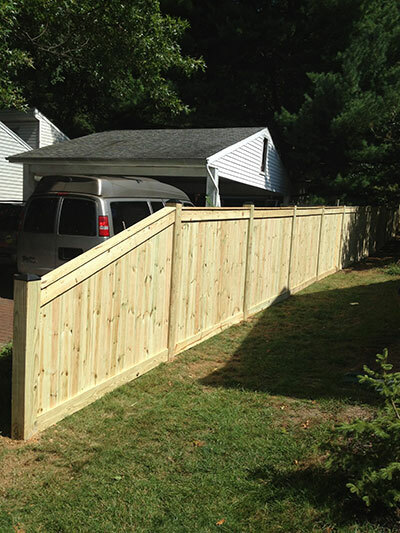 Making sure you’ve covered your bases before you install your fence will help avoid trouble down the line. Spring is here, with Summer hot on its trail. You may be one of the many homeowners around the Mid-Atlantic region who is itching to get out and start doing some yard work and home improvement projects now that the warm air is finally here. Some home improvement will be done solo, while others might require the help of professional contractors. You know what we’re getting at — fence installation! If you’re looking to get a residential fence installed in your yard soon to enjoy during the warm months, here are some things to make sure you’ve taken care of before you have a fence contractor come in for residential fence installation. If you live in a neighborhood where the houses are relatively close together, it’s good neighborly etiquette to check with adjacent neighbors about your plans to install a residential fence. It’s better to check with them ahead of time, to let them know that there will be some commotion that results in a new fence. You can also discuss property lines, ensuring that there won’t be a dispute after the fact about you encroaching on their property. This is a great way to find out for sure where your property lines are, and you can even request documentation to show your neighbors in case there’s any dispute or confusion about your lot. It’s also important to check by-laws of your city, town, or Homeowners’ Association. Some of these institutions may have regulations about fence installation or what type of residential fence you’re allowed to have, regarding height, material, and color. Many cities require a permit for residential fence installation as well, so you should know whether you need to obtain one of those as well. Residential fence installation isn’t a one-and-done deal. Adding a fence to your home means that it now requires some maintenance and TLC just like every other part of your home. Regular fence maintenance requires some work but it will help your fence look good and maintain its structural integrity, and help you catch potential problems before they become serious problems. If you have any further questions about fence installation, please contact Freedom Fence and Home by calling 443-271-6841 or visit our website. You can also follow us on Facebook and Twitter! This entry was posted on Friday, April 22nd, 2016	at 1:55 pm	. Both comments and pings are currently closed.